Goal:Drink nothing but delicious fresh fruits and vegetables for 3-5 days (or 2 days!) and feel like a rockstar at the end. Before you get started:Rid your cabinets of anything that might tempt you away from your goals.Choose your starting day; Monday is a great day to start a cleanse! Starting on a weekend can be a bit more challenging so set yourself up for success. Since your package arrived at the end of the week, make sure to place all your juices in the freezer.Tell your family and friends you're doing a juice cleanse, and get a support system going. Helpful tips:Avoid strenuous exercise while on the cleanse. If you are an athlete, this is a good time to let your body recover and rest. You can do light stretching and walking, but keep it easy.Drinking plain hot tea in the morning and/or at night can help you feel more satisfied while on your cleanse. No added sweeteners! You can even choose a herbal detoxifying tea. food TWEAKIf you train regularly and cannot go without food for three to five days, or if the thought of having no real food for 72+ hours gives you a serious panic attack, do not fear! Veestro has you covered with several meals that are juice cleanse friendly, fully prepared, and delicious.Veestro meals will work hand-in-hand with the juice cleanse, allowing your body to detox just as effectively without completely avoiding food. How and when to drink the juices:Take the juices out of the freezer and place them in the refrigerator up to two days before starting your cleanse, to make sure they are ready to drink. Shake vigorously.You can drink them straight without watering them down. 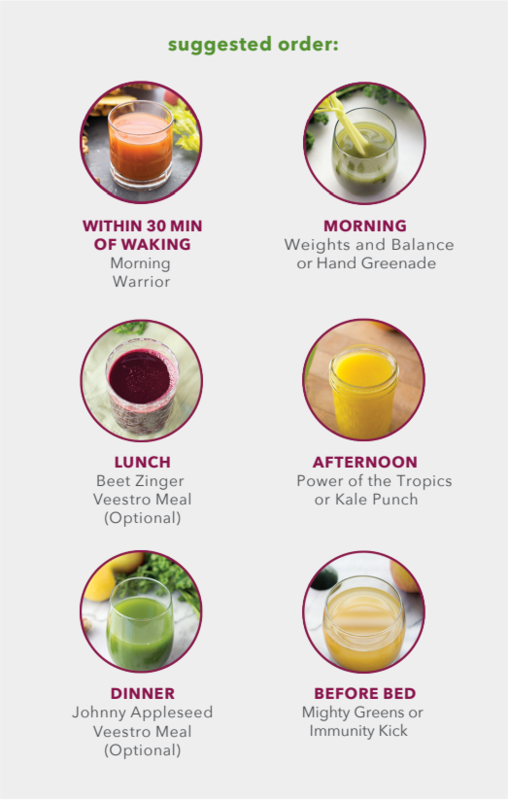 Drink the first juice within 30 minutes of waking up, then drink a juice every three hours per the schedule to the right.Try your best to stick to juice alone. If you get too hungry, choose one of the cleanse-friendly Veestro meals above. Listen to your body and drink lots of water. Final tips:Give yourself a cut off time for eating and drinking. Try no food or liquid after 7 p.m., or a time that works with your schedule. Having a set time will keep you from falling off the wagon at night, while creating healthy habits and boundaries.If you feel hungry at night, drink plain hot tea. Switch gears by brushing your teeth or reading a book. Go for a short walk and image how amazing you are going to feel at the end of your cleanse. It's only a few days of your entire life.Embrace the journey—you can do it!